The appointments were made possible thanks to a recent change in the rules. Analysts believe this decision will allow airlines to cut spending on training pilots, who have not accumulated the required amount of flight hours. 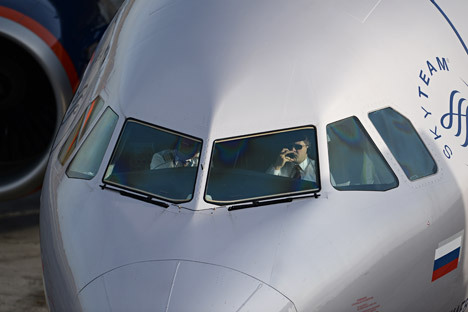 Major Russian airlines have taken advantage of a change in legislation to hire 200 foreign pilots, the Federal Air Transport Agency (Rosaviatsia), has announced. According to an official statement circulated by the agency's press service, the biggest number of foreign pilots have been hired by Aeroflot (a total of 80), with Russia's second-biggest airline, Transaero, coming a close second with 67 foreign recruits. The other airlines filed considerably fewer applications. For example, the Siberian airline Utair will be able to hire 14 foreign pilots, with KogalymAvia and Vim-AVIA, which specialize in charter flights, getting seven pilots each. Most of the pilots will be arriving from Western Europe, the Russian business daily Vedomosti reports. For example, according to the paper, Aeroflot has hired most of its new pilots in Germany. "Russian airlines have been lobbying for allowing foreign pilots onto the domestic market for about three years. The most interested parties were Aeroflot and Transaero, the country's biggest carriers," says UFS IC analyst Anna Milostnova. According to her, the main reason behind these recent amendments to the air transport legislation is the rapid growth of the Russian aviation industry, by an average 15-20 percent a year, which has resulted in a shortage of pilots qualified to serve as captains. For example, Aeroflot estimated the shortage of first pilots at 1,000 people, Milostnova says. In the spring of 2014, Rosaviatsia allowed Russian airlines to hire 200 foreign pilots every year over a period of five years. Under the new procedure, airlines submitted applications for hiring foreign pilots to the Federal Air Transport Agency, while the agency decided how many pilots each airline could hire. The decision on each airline was taken through an algorithm based on the company's air traffic in 2013, Rosaviatsia explained. Now Rosaviatsia will hand over the applications to the Federal Migration Service (which issues work permits to foreigners) and the airlines will be able to sign contracts with foreign pilots. Further applications to hire foreign pilots can be filed next year. Previously, Russian airlines were banned from hiring foreign pilots. However, in 2013, the ban was lifted for a period of five years. Interestingly, at first Rosaviatsia planned to hire 1,100-1,500 foreign pilots every year, but in the end, the figure was significantly cut. "Foreign pilots must have been offered a competitive salary, which may even be higher than in Europe, and an attractive benefits package," says leading analyst with Finam Management Dmitry Baranov. Furthermore, he continues, a system of additional benefits may have been set up for foreign pilots. Anna Milostnova agrees. "Russian airlines realize that in order to hire European pilots, they will have to offer them attractive conditions. Some surveys have shown that in major Russian airlines, pilots' remuneration is in no way inferior to their European counterparts," she says. At the same time, experts stress, there is no shortage of pilots in Russia per se, but there is a shortage of pilots with a large number of flight hours. "Russia did not and does not have a shortage of pilots in general. However, airlines do not seem to be prepared to spend money on retraining pilots to qualify as captains," explains Milostnova. In Europe, the aviation industry is more mature and grows at a slower pace than in Russia, just 5 percent a year, she continues. "For Russian airlines, the opportunity to hire foreign pilots is, of course, a big plus. In addition to filling the gap, it will also increase completion among pilots," Milostnova concludes.